The famous seasonal San Diego ice rink returns, just steps from the sand. Sunsets over the Pacific and pirouettes? It's a classic scene, come late November through early January, outside Hotel del Coronado. 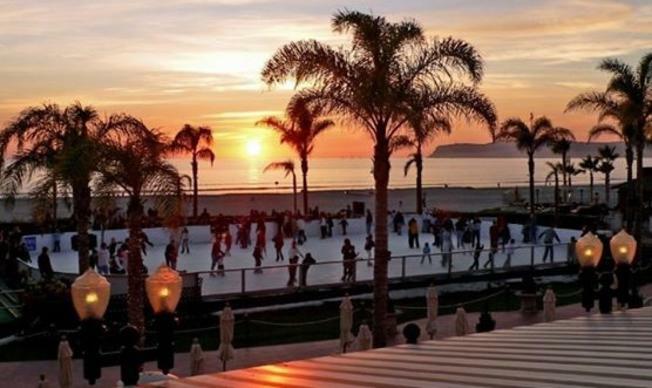 HOTEL DEL CORONADO, a destination that does it up at the holidays, and one of the best expressions of that is the Skating by the Sea ice rink. It is, indeed, an ice rink, one that sits with both a view of the handsome hotel and the Pacific Ocean. The rink remains open for several season-sweet weeks — Nov. 22, 2018 through Jan. 1, 2019 the dates this go-around — and Make-A-Wish San Diego is the beneficiary. A ticket? It's $30, and, for sure, your skate rental is included. Keep in mind that Christmas and some of the other big occasions will sport different hours, schedule-wise, and do note the special events, like the Holiday Festival and Chanukah on Ice, popping up on particular days. SO, HOW'S THE WATER? If you've got a toe in the Pacific, it is probably mild, or a little cool, but "frozen solid," it is not. But there is a "frozen solid" sheet to be found outside The Del, and, for sure, you can spin on it, while wearing ice skates, a short stroll from the Coronado sand.